Aslı Çavuşoğlu, "Stendhal Syndrome", 2005. Video still. 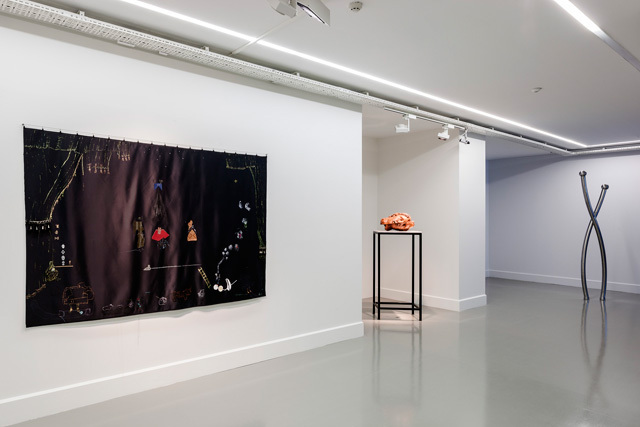 Özge Ersoy’s “Intolerance, Antagonism, Foolery” and Merve Ünsal’s “Surface Tension” are two articles commissioned by ARTER in Istanbul for the exhibition catalogue of Envy, Enmity, Embarrassment—a group show that was open between January 24–April 7, 2013. Both articles are reproduced below with introductions by the artists they’re focusing on, Aslı Çavuşoğlu and Hera Büyüktaşçıyan, respectively. Below is a text by Özge Ersoy, a writer and curator who’s been thinking and researching about collections. Here, Özge discusses Gordion Knot (2013) and Stendhal Syndrome (2005)—two works of mine that are in the exhibition Envy, Enmity, Embarrassment at ARTER. In her essay, Özge draws a parallel between the search for the mythological hero Alexander the Great who’s been a subject of enmity between Greece and Macedonia, and how the process of building and showing museum collections creates new identities in Turkey. She thereby emphasizes the questionalibility of contemporary art and historical heritage when they are subject to history writing. The text also reveals Özge’s own concerns in her field of interest, namely hasty collecting impulses in geographies like Turkey, where recent art histories are yet to be written. Despite all—intolerance, antagonism, and foolery included—history continues to be written, but perhaps with the acknowledgment of a mirror that could reflect this charade, and maybe with a glimpse of a hesitation. Aslı Çavuşoğlu, “Gordian Knot”, 2013. Photo by Hadiye Cangökçe. A bust of a young man reclining on a long, thin pedestal, his mouth slightly ajar. His wavy hair has been combed back, exposing his forehead, featuring distinct wrinkles. The line that symmetrically divides his head in two is not due to any damage caused to the sculpture; it is in fact the result of it being divided into two pieces and then reunited. 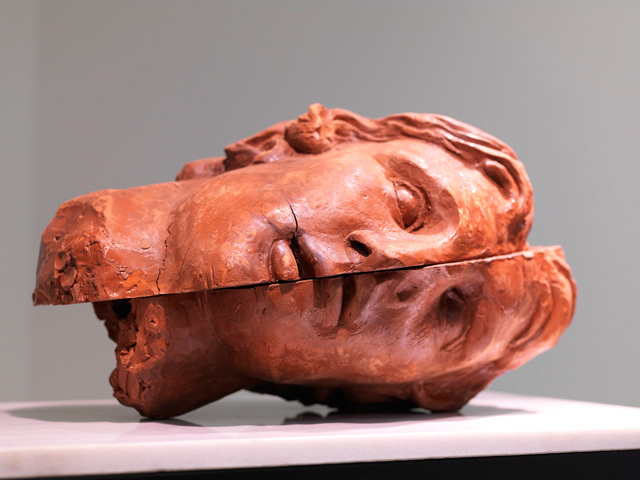 The departure point for this installation by Aslı Çavuşoğlu entitled “Gordian Knot” (2013) is the head of Alexander the Great, a sculpture dated to the 2nd century BC and part of the Istanbul Archaeological Museum’s Collection. In this work, the artist is interested in exploring the ways in which social and political history is written and interpreted. In replicating this sculpture that was unearthed at the Pergamon excavations, she first divides the whole into two pieces and then places the two halves back together. However, she does this in such a way that they do not fit perfectly. It is possible to interpret this intervention by Çavuşoğlu in terms of two competing historical discourses that seek to instrumentalise Alexander the Great in order to lay claim to their authenticity. The way the sculpture is presented, on the other hand, poses another question: how does the act of display historicise the exhibited object, and how does it create or distort its value? In “Gordian Knot”, the method applied in exhibiting the sculpture may be read as an extension of a similar questioning. The head, separated from the body, and placed horizontally on the pedestal, succeeds in disrupting the monumentality of a passionately adopted “national hero”. Concepts evoked by the sculpture are vulnerability and fragility, rather than might, power or grandeur. This ambiguity entails dualisms such as life/death and sleep/wakefulness. The unconventional display no doubt relates to the link between exhibition and propaganda, or in other words, the negotiation that takes place between the exhibitor, the exhibited, and the audience. What lies in the centre of this negotiation is the ongoing instrumentalisation of heroes in the construction of common identities. Focusing on the close relationship between the field of cultural heritage and belonging, continuity and display, it is important at this point to state that Çavuşoğlu begins this investigation within the context of contemporary art. Aslı Çavuşoğlu, “Stendhal Syndrome”, 2005. Video still. Çavuşoğlu’s work entitled “Stendhal Syndrome” (2005) encourages the viewer to question which types of identities the recently increasing number of exhibitions and museums serve to form. The seven-­second video, which references a psychosomatic illness mentioned in Rome, Naples and Florence, a travel book published by Stendhal in 1817, documents the artist fainting in front of a work exhibited in a museum. 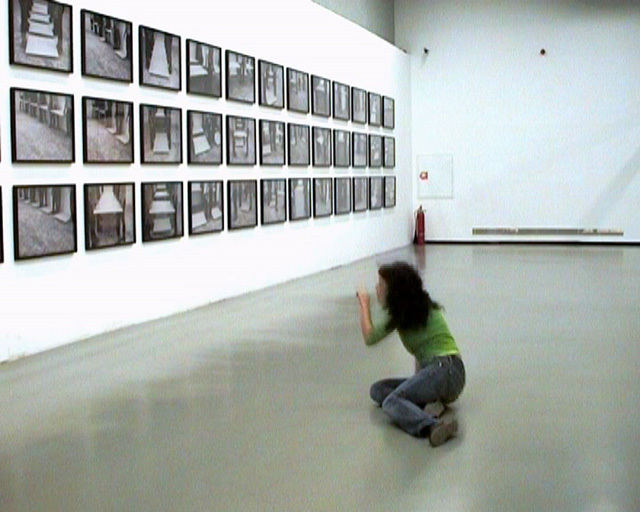 The syndrome is defined by symptoms such as dizziness, fainting or hallucination caused by the viewer’s exposure to many “impressive”, “valuable” or “beautiful” artworks all at once, or in a short period of time; and it is necessary to point out that it is both about the identity of the institution Çavuşoğlu aims her camera at, and the relationship contemporary art forms with representational mechanisms. A work by Santiago Sierra exhibited at “Centre of Gravity” (2005), one of the first exhibitions held at Istanbul Modern, informs the background of “Stendhal Syndrome”. However, Çavuşoğlu is not voicing any direct criticism towards either the museum seeking plaudits by bringing the works of established figures such as Jeff Koons, Anish Kapoor or Sierra to Istanbul, or to the public support the institution received during European Union membership negotiations, or even the museum being branded as the “changing face of Turkey”. The artist’s investigation focuses instead on rapid museumification, and hasty collectorship reflexes. As in “Gordian Knot”, the relationship between the exhibited object, belonging, and memory is brought to the fore here as well. One could suggest that Çavuşoğlu, by recording her fake fainting in the museum on video, makes fun of the rapidly expanding art market and also of the adoration shown by an art audience that is growing along with the increasing number of art institutions, in response to the great names “brought to Istanbul” by museums. However, in countries like Turkey where even the first account of recent art history is yet to be written, the fact that investigations into the exhibition and historicisation of the artwork come from the artist—the person at the heart of production—should be perceived as the beginning of the artist’s demands regarding collections and institutions. Especially in the present climate where contemporary art is presented as more experimental, more international, more engaged, or in short, “better” than modern or traditional art, it is of great value that the task of carrying out such an investigation has been taken on by an art- ist. However, it is also possible to read this performance as the starting point of an artist—whose works have not yet been historicised—in discovering the relationship between contemporary art and cultural heritage. “Stendhal Syndrome”, one of the first works in which Çavuşoğlu focuses on historiography, forms the point of departure for an interrogation that prepares the platform for “Gordian Knot”. It is no surprise that questions centring on continuities and discontinuities in historiography should begin with a newly opened private museum exhibition; similar visual productions meet their audiences in such museums and strive to become part of public memory. These two works are based on minor interventions and they may seem swiftly edited; they do not communicate their message in an aggressive tone, or in a single session. 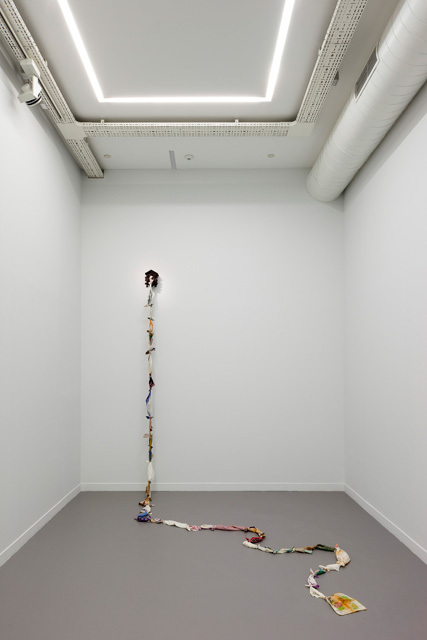 They are, rather, phases in a long­running investigation regarding the creation of common values via exhibited objects. In this process, Çavuşoğlu continues to display how fragile the cult values ascribed both to historical personalities and living artists really are. It is no coincidence that the two works mentioned in this text are brought together in an exhibition titled “Envy, Enmity, Embarrassment”. After all, the kind of historiography Çavuşoğlu examines is practiced both thanks to and despite of intolerance, antagonism, and foolery. Left to right: Nilbar Güreş, “Twin Goddess: The Sketch of an Encounter”, 2012. Aslı Çavuşoğlu, “Gordian Knot”, 2013. Şener Özmen, “Pole Escaping Its Flag”, 2012. Installation view: “Envy, Enmity, Embarrassment”, Arter, 2013. Photo by Murat Germen. I begin by thinking about how to read artworks—not only from the perspective of an art critic but also as an artist, a colleague who takes a distance from her own practice and becomes a detached observer in order to write and contemplate about another artist’s works, in a different dimension. Provisionally positioning the self in someone else’s visual and conceptual memory and practice creates a new performative, fluid ground for the artworks to be perceived in. For me, Merve’s contribution of reflecting on each piece was beyond her words; it was more about her participation and presence as an observer, an outside perspective and a translator of my whole creative process into words. At this point, I appreciate this incognito connection and her presence within my own mental space which, I think, was verbalized powerfully. Hera Büyüktaşçıyan, “The Missing Cuckoo”, 2008. Installation view: “Envy, Enmity, Embarrassment”, Arter, 2013. Photo by Murat Germen. “Terk­i Dünya”, “The Island”, “Somewhere in the Middle”, and “The Missing Cuckoo” are four works by Hera Büyüktaşçıyan, in which the artist brings to life social memories through found footage and installations. The four works manifest Büyüktaşçıyan’s propositions for the problem of consolidating personal memories, histories and perceptions in terms of the family, the community and society, and perhaps most importantly, in terms of a chronology. Self­aware transience is the crux of Büyüktaşçıyan’s works, which permeate the everyday, exploring the exceptional, the ephemeral, the past, the present, the familiar, and the unspoken. Such categories are convenient, but Hera seeks to blur their boundaries. “Terk­i Dünya” was made from footage from three reels of film that Büyüktaşçıyan’s grandfather Theodoros put together in 1968-­69. He filmed family get­togethers, including birthdays, dinners, and carnival celebrations. Hera’s intervention with respect to the footage is minimal: she combined the three reels into one and added subtitles in Turkish and English, since Theodoros’ original chapter titles were in Greek. It is important here to discuss the critical gesture of including, in the opening title of her work, “Through the Eyes of Theodoros…” as this phrasing captures the essence of the artist’s use of the material. The gesture of showing the footage in a contemporary art space is not the most important aspect of her production, but, rather, it is the framing of the footage through the titles that take precedence, through their acknowledgement and bridging of time and place. In other words, Büyüktaşçıyan empowers Theodoros— giving him a voice, raising him to the status of an author—through the simple act of transferring the video to Arter’s space and this newly­found presence defeats nostalgic connotations in terms of the content. In this video, Theodoros is thus documented as someone who records all that is festive and entertaining—an observer who appears in a few frames, whose social appeal is felt through the looks directed at the camera/him, the glasses that rise in his honour, the smiles that linger for a few moments. Watching the footage, it appears that their household was a festive place. It is impossible not to notice the re­appearance of the same people for different events. While the number of people who are around the table for each celebration is suggestive of a close­knit community, the constant re­appearance of its members starts to become claustrophobic by the end of the video. The domestic atmosphere, the dinner table, the island where they went for the summer begin to evoke questions of the accessibility of the inhabited space; whether others could or would be able to participate in these intimate moments. It is possible to trace the social history of why this group of people is so insular. The work’s title, “Terk­i Dünya”, is not only the name of an area in Heybeliada that encompasses a monastery, but also the name of a place where aged horses wait for their death—an area beyond sound, time, and physical reality. Left to right: Hera Büyüktaşçıyan, “The Island” and “Somewhere in the Middle”, 2012. Installation view: “Envy, Enmity, Embarrassment”, Arter, 2013. Photo by Murat Germen. Here, I’d like to draw a parallel with Luis Buñuel’s The Exterminating Angel, in which the director transforms a dinner party into a nightmare, by having the guests at the dinner party lead themselves to believe that they are trapped in the living room of the house they were eating in. The situation is resolved when they realise that it is their own belief in self­entrapment that has kept them in the room. Büyüktaşçıyan deconstructs a similar mechanism in “Terk­i Dünya”—a jovial situation is subtly transformed through duration and repetition. “The Island” functions in a similar way— the viewer’s ignorance as to what is underneath the rug, and the simple presence of objects that are presented as neutral, point to our own tensions and beliefs, which are projected onto these objects. “The Island” is a spatial transliteration of the saturated, redolent nature of the domestic. The chair, balanced just right, is a chair that is familiar for many viewers. The rug is equally intimate for most, especially in the context of the exhibition, since it is a decorative domestic object. The third element in the installation is ambiguous: the bump—for lack of a better word—is a blank surface, a premonitory projection of our own fears, desires, and thoughts. The domesticity of the objects and the undefined, ambiguous shape of the rising surface of the rug invoke an organic growth underneath. On the one hand, the bump has a fairy­tale quality, suggestive of sprouting, flourishing and fertility. On the other hand, there is a metamorphic force at play—the juvenile fear of mundane objects being transformed is precisely the crux here. Büyüktaşçıyan estranges the mundane through a similar intervention and I find the simplicity of what she has done here infuriating—my being disturbed, triggered, titillated by such a minor “change” in my daily surroundings is revealing of how close to the surface all of those sensations and pressures are. “Somewhere in the Middle” is a subversive version of “The Island”; the elements are combined to create an absurd situation—a medley of elements that relate to the idea of the artist’s home as an extension of her own body. The casts of her hands, holding two oars, are placed on a table that is stacked on another table of similar size. The proposed movement, in contrast with the stability and immobility of the two tables, is an acknowledgment of Büyüktaşçıyan’s own rootedness. The artist’s understanding of her own ineptitude in talking about, expressing, or changing the (lack of) political memory is not a defeatist statement, but rather a self­aware gesture, situating her work within this “equilibrium”. The models of Büyüktaşçıyan’s hands refer to door knockers—an architectural detail used to denote the social and financial status of home owners. We thus see an appropriation of an element based on Büyüktaşçıyan’s observation and recognition of these hands in Anatolia. The door knocker, which is sometimes a human hand in these anthropomorphic versions, has a very specific connotation in Turkey—the ominous “knock on the door” refers to forced displacement, to historical attempts to erase and obliterate ethnic and social histories. The artist, by taking a model of her hand and mimicking the form of the knocker, places herself within the homes whose doors were knocked on. The hands, taken out of context and placed horizontally on the tables inevitably have violent implications, since they have been detached from the body. The repositioned hands, divorced both from their function on the doors and from the artist’s body, provide a fitting image for the expression of the artist’s struggle to understand her own agency in the present with respect to past events and their effects. 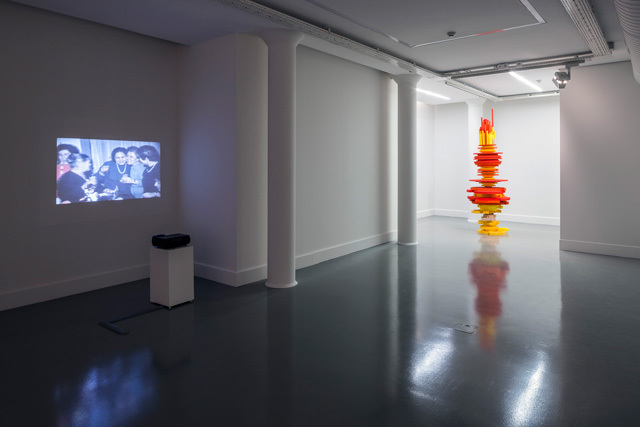 Installation view: “Envy, Enmity, Embarrassment”, Arter, 2013. Photo by Murat Germen. “Somewhere in the Middle” is also an extension of the metaphor in “The Afternoon Odyssey”, a performance project in which the artist aimed to create a situation of collective empowerment by having a group of participants construct paper ships using the Greek newspaper Apoyevmatini in Istanbul, at SALT Beyoğlu’s ground­level forum on İstiklal Street. 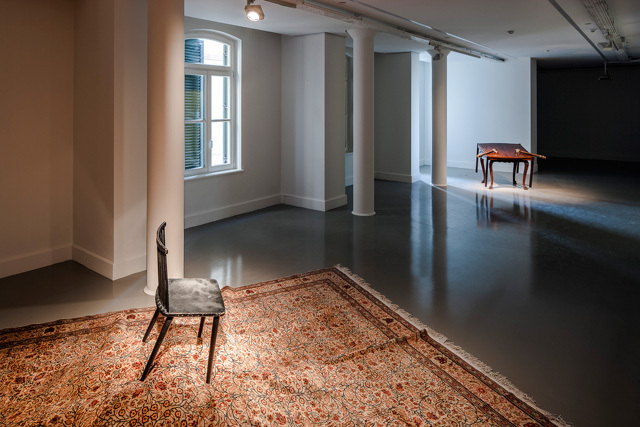 İstiklal has a specific socio­political history and helps to contextualise the performance and the four works displayed at Arter’s space. The simple act of constructing paper boats from newspaper thus becomes an articulation of an increasingly forgotten language and minority in Turkey. It provides a form of re­engagement and reinvigoration of time and memory. “The Missing Cuckoo” is an installation­based work that presents a plan of escape and departure, in contrast to “Terk­i Dünya”. An action is described in the hanging handkerchief—one that might have been accomplished, or that is being planned for the future—while the closed door of the cuckoo clock produces a tension between the way in and the way out, giving rise to doubts as to whether there is any way to permeate this “interior”. The cuckoo, the protagonist of the story told by a single object, is also missing. It may exist both behind the closed door and outside in our realm somewhere, or it might never have existed. The writing, erasure, and re­writing of socio­political histories can be traced through the cuckoo that might or might not be there. The invisibility of the cuckoo relates to the claustrophobia encapsulated in “Terk­i Dünya”, a kind of sealed­off isolation that is palpable, yet non­confrontational. If Büyüktaşçıyan’s works are transliterations of our shared political, social, and personal histories into objects and images, it would be apt to draw a parallel with language. Büyüktaşçıyan’s works are not exclamation points or question marks or full stops; “Terk­i Dünya”, “The Island”, “Somewhere in the Middle” and “The Missing Cuckoo” are semi­colons—a punctuation mark that indicates a pause, typically between two main clauses. The works are inexorably and actively connected with what happened before and what will happen in the future. Posted in content, on artists and tagged Arter, Asli Cavusoglu, Özge Ersoy, Gordian Knot, Hera Büyüktaşçıyan, Merve Ünsal, Somewhere in the Middle, Stendhal Syndrome, Terk­i Dünya, The Island, The Missing Cuckoo. Bookmark the permalink.